Eleven countries operate 13 telescopes at the top of Mauna Kea, known as one of the planet's best places to stargaze (it is also where NASA tested its Mars Rover, thanks to the terrain's Mars-like characteristics). To reach the 14,000 ft summit, you'll need a 4-wheel drive vehicle, though most cars can reach the visitor's center a few thousand feet below (be sure to check your rental car agreement; most allow you to go to the visitors center). Dress in warm layers as temperatures can fall below freezing at night. The only downside to doing this excursion on your own is that you won’t have a guide to help you navigate the cosmos, so do your homework, and be sure to download a stargazing app to help you understand what you’re looking at. Like Mauna Kea, Haleakala is a popular destination for tour operators that bring groups to the summit to see the sunrise, but you can get there easily and cheaply on your own. The park entrance fee is $10 per car and it's good for three days. The road up through the park is well paved and dead-ends into a parking lot at the visitors center, which is located at an elevation of about 10,000 ft. Arrive early to stake out a good vantage point, as it can get crowded about an hour before sunrise, when the tours begin to arrive. You'll witness a color show well before the official sunrise, so be sure not to oversleep, and don’t be discouraged by the crowds – this famous attraction is more than worth it, and there's plenty of room for all. 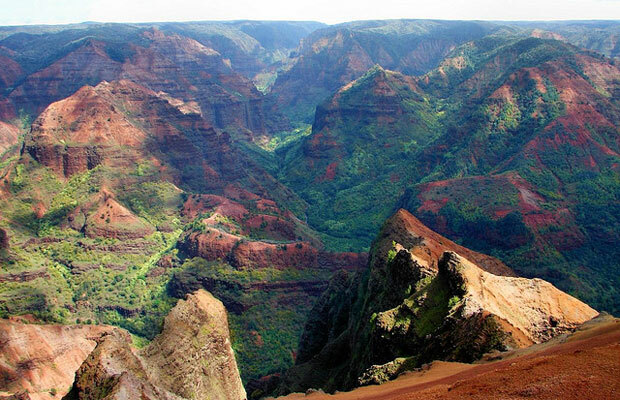 Did you know Hawaii has its own “Grand Canyon?” Waimea Canyon State Park on the island of Kauai contains a canyon that is ten miles long and 3,000 feet deep. Along with the adjacent Koke’e State Park, the area contains scenic lookouts and hiking trails that go from the canyon to the northwestern part of the Na Pali Coast. Entrance to both parks is free and Waimea Canyon Drive is well paved and runs up the hill from the small town of Waimea on the south coast. A popular spot for day cruises and tour boats, you can access this pristine snorkeling bay easily by simply driving the highway south from Kona (about a half hour). Kealakekua Bay (free admission) is historically significant as the place where the first westerner, Captain James Cook, landed on Hawaii Island in 1778. The big attraction here, though, is the crystal-clear water, which is perfect for snorkeling. Buy or rent a mask for a few bucks at a local surf shop and spend a half day amongst the coral. Over in Volcanoes National Park, you can get close to flowing lava, which you can see from different lookout points. Entrance to the park is $10 per vehicle and is good for seven days. The website has a webcam and information on where to best see the lava based on the current conditions in the park.